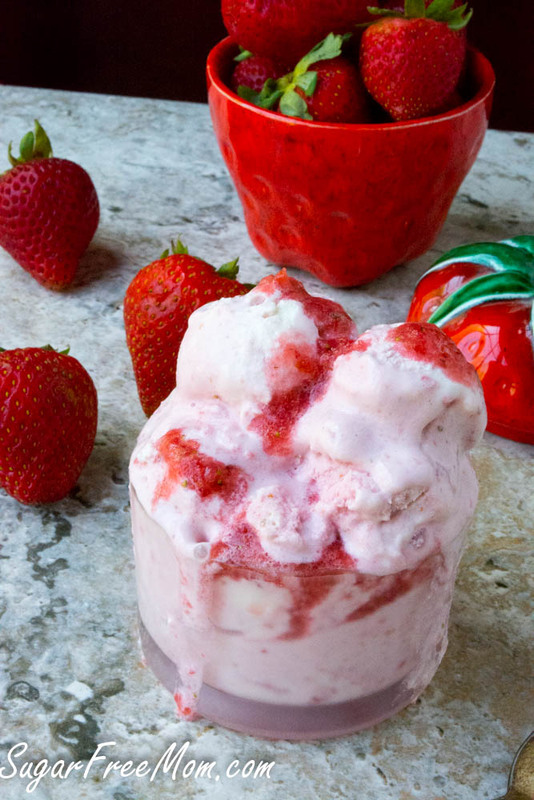 You’d never know this Strawberry Cheesecake Swirl Ice Cream is low carb and made without sugar! There’s just something about ice cream in the summer that makes it tastier than any other time of year! Could be the heat of summer and the cold creaminess of ice cream, but whatever it is, we all want it! I don’t know anyone who isn’t a lover of ice cream, do you?!!! 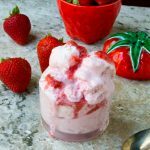 Making use of fresh seasonal fruit like strawberries is why this recipe today will rock your ice cream world! 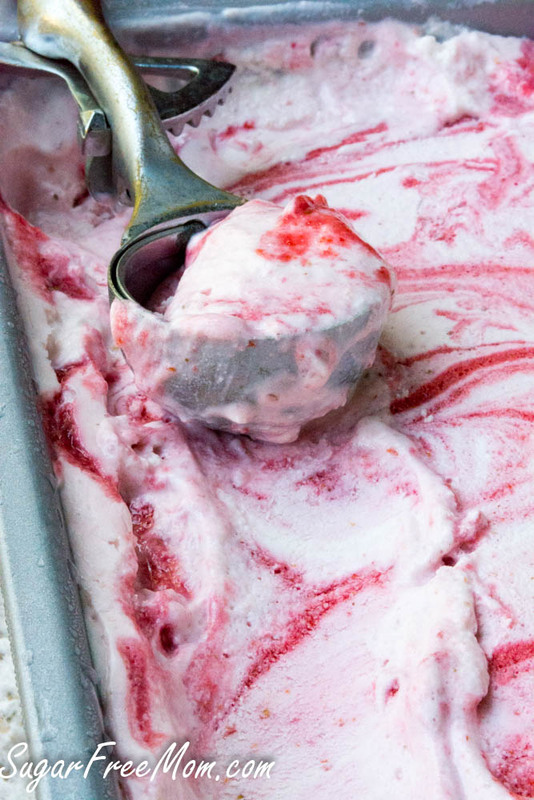 Sweet strawberries pureed and swirled into cheesecake flavored ice cream will make your tongue do a happy dance! You don’t have to make this swirl look but it’s worth the little bit of effort to make it happen. If you decide to just mix the pureed strawberries into the cheesecake ice cream in the ice cream machine I won’t judge you for it! It will be pretty in pink! 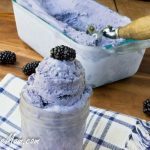 This recipe was a winner with the whole family, picky kids and picky hubby who dislikes stevia! He didn’t notice any aftertaste so even those of you who aren’t fans of stevia may like it as well! 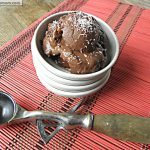 Impress ALL you friends with this deliciousness,whether they are sugar free and low carb or not! You don’t need to use berry flavored stevia but it does enhance the strawberry flavor the best. If you don’t have Swerve and use another sugar free substitute, most other brands are sweeter than Swerve so I would suggest eliminating the stevia. Half & Half is half whole milk and half cream, equal parts. Place the first 6 ingredients into a high powered blender and blend until smooth. Set aside. Place the softened cream cheese and half & half into a stand mixer and blend on high until smooth. Add in the remaining ingredients and blend on high until incorporated. Taste and adjust sweetener if needed. Pour the cream cheese mixture into an ice cream machine and follow manufacturers instructions. Mine is a KitchenAid attachment and it took about 20 minutes before it was soft serve texture. Drizzle in the strawberry mixture into the ice cream machine on low or stir in by hand. Reserve some for topping. 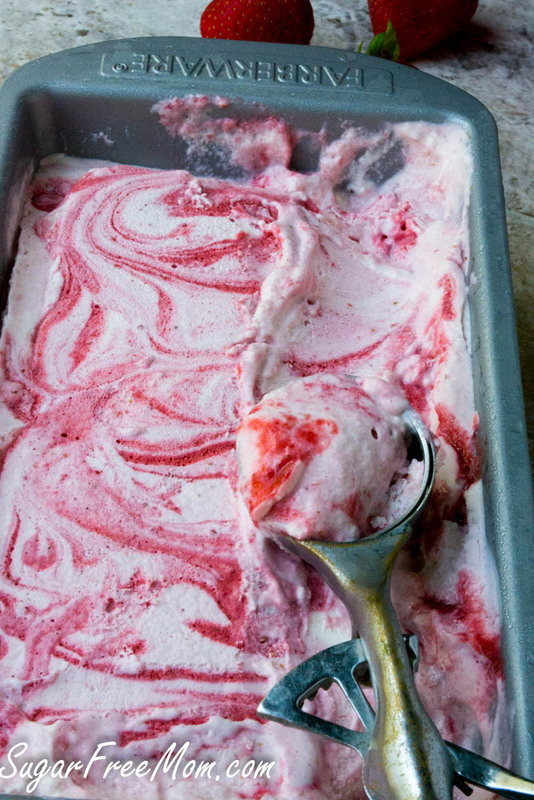 Place ice cream into a 9 by 5 loaf pan, drizzle pureed strawberry over the top then freeze for 2-3 hours. 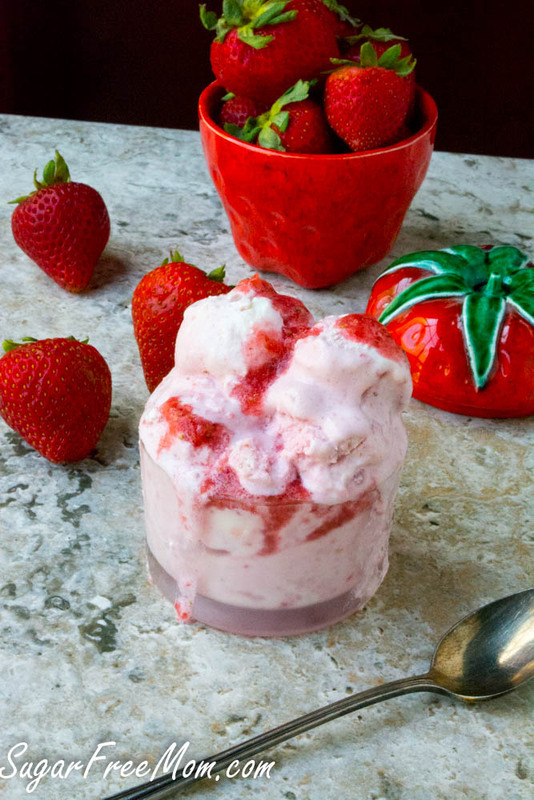 If you reserved some of the pureed strawberry, keep it refrigerated until ready to serve over the ice cream. There are 4.8g of Sugar. 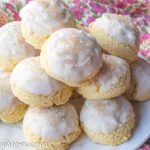 Why is this recipe here on Sugar Free Mom. Not sugar free?? I use fruits in recipes on occasion, it’s a natural sugar coming from the strawberries. 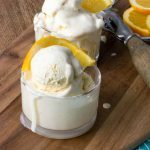 I have kids and make recipes for my family that I share. The key for my family is no added sugars. Eliminate the strawberries and make it without as cheesecake ice cream and it will still be delicious. This looks wonderful! Huckleberries are in season in the northwest, so I may substitute for the strawberries. OOh, the possibilities! Thanks for the user friendly and delicious recipes! Half & half? Is this milk? It’s a natural sugar coming from the strawberries. Thanks for the user friendly and delicious recipes! Tried this recipe and it was great! 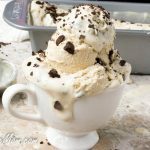 The best low carb ice cream I have tried to make. I made this ice cream this week, and WOW, what a winner! Definitely company worthy! Thank you so much for the recipe. I’d love to make this strawberry ice cream but don’t have an ice cream machine😩 Any suggestions ? Thanks so much! Maybe just mix in blender and make into popsicles molds? How could I go about eliminating the swerve and using entirely stevia? I am currently breastfeeding my 3 week old son and sugar alcohols make him gassy. You can use just stevia but you’ll just have to keep adding a little bit at a time until you get the sweetness you want. Do you use Granular or Confectioners Swerve? This was excellent! I made it with raspberries and just threw it all in a vita mixer before my ice cream machine. I used Pyure and only used 1/2 cup in the whole thing and 1/4 tsp liquid stevia. It was very sweet and my kids thought almost too sweet. Maybe Pyure is sweeter than swerve? I would skip the liquid next time and maybe even cut down the powder. Anyone have experience between the two sweeteners ( Pyure and swerve)? Overall so, so good! Like someone else said, definitely something I would make for company but I am new to cooking with these sweeteners and there probably is a difference between the two. Thanks for the recipe! Could you use almond milk instead of half & half? You could, just not sure how creamy it will be. Could I use just heavy cream instead of the half and half? Heavy cream has less lactose in it so it doesn’t really cause me lactose intolerance issues. Can’t wait for summer to come so I can make this recipe. Pinned it! Question: what is the serving size translated into ounces? I can’t seem to figure it out. This afternoon I made your wonderful recipe again but I give it my own twist. I put my mixing bowl for the cream cheese mixture in the freezer for an hour or so before starting. 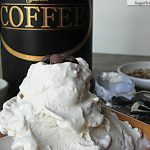 It whips up much faster and formed peaks like it would when making whip cream topping. I also skip the 1/2 and 1/2 and just use the heavy cream. 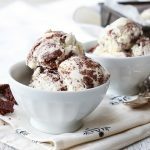 I did try it with almond milk when I attempted a chocolate almond swirl icecream. I made a chocolate sauce in a saucepan over medium heat, whisking in 1 cup heavy cream and 1/3 cup sweetener. Once it is simmered remove from heat. Add 2.5 ounces of dark choclate, stirring and letting it melt into the warm mixture. Finally adding 1/2 teaspoon of vanilla. Add chopped chocolate and let sit 5 minutes, stirring until chocolate is completely melted. I lightly brown shaved almonds in the oven for a few minutes on a cookie sheet and when cool, I then add to the cream cheese mixture. I don’t add the chocalte until it is well cooled in the fridge for 30 minutes or so. I use the same technique of swirling the choclate. 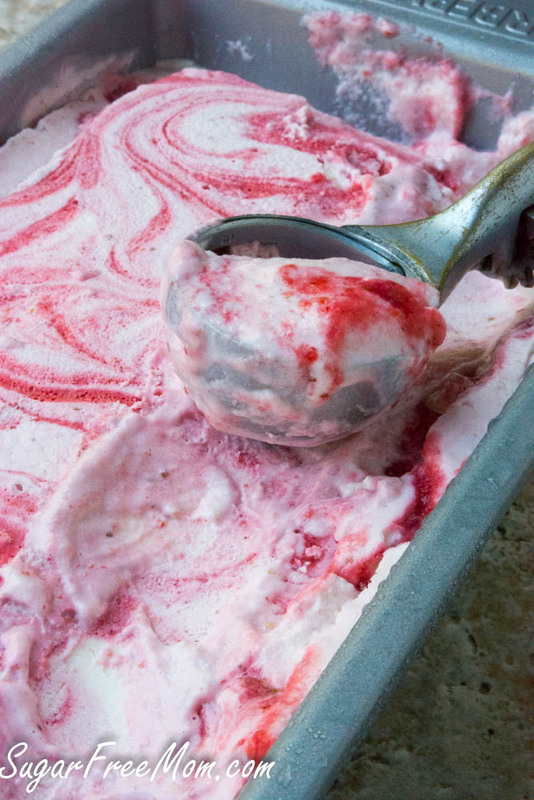 When making the strawberry swirl icecream, I usually store my icecream in a see through plastic container and fill the bottom with some of the strawberry puree before adding the cream cheese mixture. This way I don’t have any strawberry puree to store in the fridge. Tonight’s dessert is now ready and there are three boys here that can not wait ( as usual) for supper to beon the table! The biggest of the boys says my icecream tastes better than Breyers! I have also done this recipe with frozen fruit like black cherries ( my favorite), raspberries and blueberries. Thank you for tthis versatile recipe.